The Combat Jungle fixed blade from Fox Knives carries its blade weight to the tip, making it a chopping force to be reckoned with in the jungle and elsewhere. 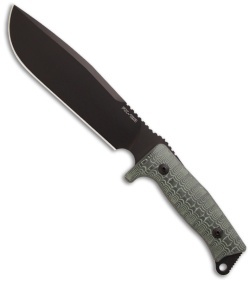 The N690Co steel blade is black coated and the handle is fitted with Micarta scales. 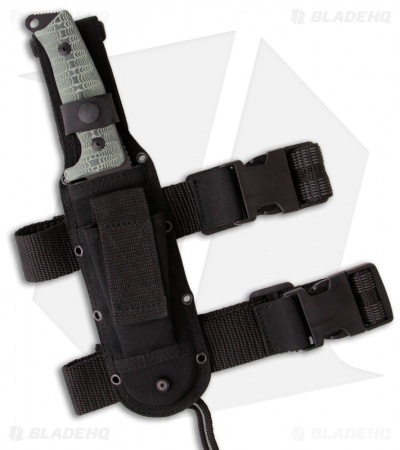 The Combat Jungle is a heavy duty knife and comes with a nylon sheath that includes leg straps for carry. I spent months researching knife designs, blade geometry, handle ergonomics, and blade steels for a true "survival" knife and the result was this model, the Fox Combat Jungle. The blade design is ideal for extended field use. Flat for quick easy touch ups after hard use; generous belly for sustained slicing (dressing game); and a robust tip to prevent breaking during prying. The tapered swedge is perfect for delimbing deadfall, therefore preserving the cutting edge and the extended jimping past the thumb ramp pairs perfectly with the choil for choking up when you need better control. The micarta handles are grippy when wet with water and blood and are very comfortable with no hot spots after hours of chopping and batoning -which this knife excels at. And the steel- N690Co- AMAZING edge retention and superior corrosion resistance. It still shaved hairs after nearly 2 hours of hard use on knotty dense logs that needed splitting. One last thing- for its size, it's amazingly lightweight. I may buy another just in case Fox ever decides to stop production on this -although I can't see why they would. Designed by the legendary Italian knife maker Molletta, this to me is probably the best all-in-one knife I have ever found. Can't say enough good about it!